Before you read any further, make sure you’ve read the title. Diet can assist to manage symptoms of endometriosis. It’s not a cure. If anyone tells you that eating a certain way will cure you, roll your eyeballs as hard as you can. Raw vegans of a clean-living bent are the worst for doing this, and I say this as a die-hard vegan myself. Now, not everybody will experience flare-ups from the same foods. Some endo-sufferes can eat anything and not have a single issue. Others only have to look at a trigger food (food that triggers a bad reaction) to feel like they’re about to die. Broadly speaking, there are two main diets that people with endo tend to adopt to manage symptoms. Those who suffer mostly from uterus pain will probably opt for the Endometriosis Diet. Those who have more difficulty with their gut may prefer the Low FODMAP Diet. I’ve tried both, and experienced more relief from the FODMAP diet because I have trigger foods that aren’t excluded by the Endometriosis Diet (namely onion and garlic). This is because of the endometriosis on my bowel, which is severely irritated by trigger foods. The Endometriosis Diet is a little more simple than the low FODMAP diet. It is basically made up of foods you should avoid and foods you should eat lots of. It’s important to note that for the endometriosis diet, it is recommended not to eat the skin of fruits and veggies. This is because of the risk of absorbing pesticides, that would put an extra load on already strained internal organs. The aim of this diet is to eliminate anything that contains lots of hormones or has inflammatory properties, as these can all trigger endo flare-ups. It’s very compatible with a vegan diet. It’s obviously spectacularly healthy. I didn’t have too much luck with this diet. Eliminating sugar is really hard – fighting the pain and getting through a difficult day takes a heck of a lot of self-control, so I don’t have too much left in the tank to battle sugar cravings as well. Thankfully, I find that, as long as I don’t binge sugar, it doesn’t have an effect (sugar binges absolutely do, though). I can’t comment on what effect red meat, eggs or dairy might have on my endo, as I was vegan for quite a while prior to my diagnosis. Alcohol is a trigger, so I have to be careful with that, although I do find it is drink-dependant. I had a very small glass of whiskey (neat) the night before last, and I have been in nasty pain ever since. It’s about a six as I’m writing this. However, I’ve had a cosmopolitan or a gin-based cocktail before and been fine. Either way, I definitely can’t drink a lot, and I should definitely avoid alcohol entirely if I have something big coming up. Like trying to get to work on a Monday. I can handle a couple of cups of caffeinated tea (green or black), but coffee makes me sick. I think that’s more the gastritis than the endo, though. I don’t seem to have a problem with soy milk, either. Unfortunately, many of the foods that the endo diet encourages are massive triggers for me – garlic and apples both leave me in big pain, apricots play havoc with my bowels, and cauliflower has results that are no fun for anyone, me least of all. Unlike the Endometriosis Diet, in which you just stop eating bad things, the FODMAP diet has two stages. First, you eliminate all high FODMAP foods for six weeks. Then, you slowly introduce FODMAP foods back in to see what you can handle and in what quantities. FODMAP stands for Fermentable, Oligosaccharides, Disaccharides, Monosaccharides And Polyols. Fermentable is stuff that needs to be broken down by the large intestine, and everything else is a sugar. It gets very sciencey, and people who suffer really serious bowel-issues get incredibly technical about it. I just have IBS because of the endo, and tolerate many foods just fine. 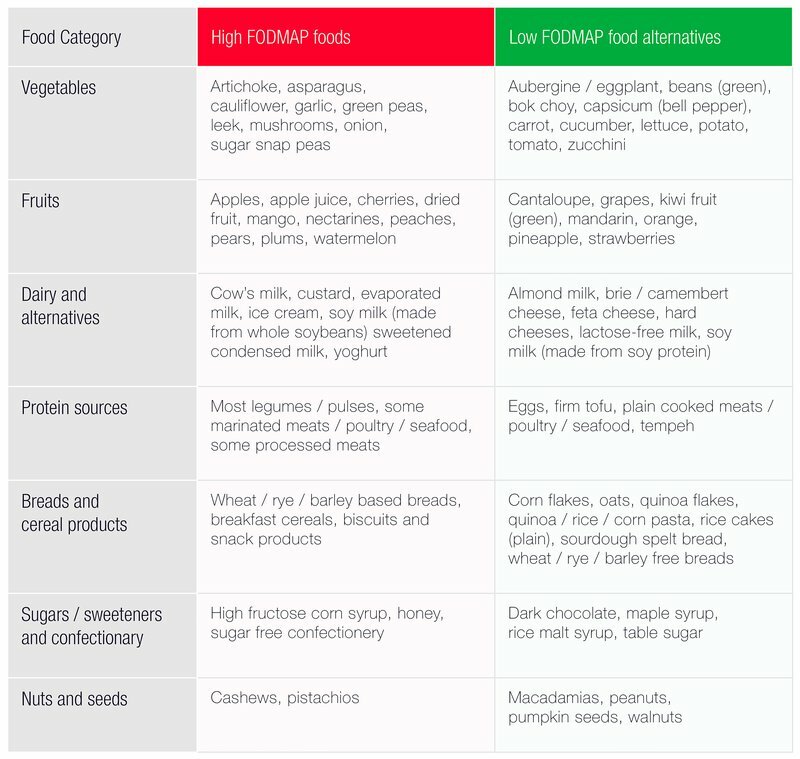 This excellent table from Monash University is a really good breakdown of good and bad foods, although it obviously isn’t exhaustive. As you can see, this diet is also compatible with a vegan diet, and I’d recommend the facebook group “Low FODMAP Vegans” for support and ideas. There’s also a fabulous recipe book called Low-FODMAP and Vegan: What to Eat When You Can’t Eat Anything, which is full of some really tasty recipes. I particularly like the tempeh bacon. What I really like about this diet is how flexible it is. You can really nail down what specifically causes you problems and in what portions. For instance, I am fine with a bit of gluten (a bowl of cereal, a small sandwich, a slice of cake). However, if I were to try and eat one of those massive sandwiches they make in restaurants with bread slices two hands thick, and then follow it up with a baked doughnut, that amount of gluten would have me reeling in pain. I’m also far more gluten-intolerant during a flare-up. I also used to be far less tolerant than I am now, but have slowly built it back up. That being said, I do limit my gluten intake. Having said all that, it’s not gluten itself that is the issue in the low FODMAP diet, it’s a particular type of sugar in gluten. Baker’s Delight sells a great low FODMAP bread that isn’t gluten free but it perfectly fine for me. However, many people who need the diet can’t handle gluten at all, so listen to your body. If I eat these things, I will be in pain. Avoiding them doesn’t guarantee that I’ll be pain free, but it does mean I won’t have extra pain. I would strongly encourage anyone with endometriosis to seriously consider trying either of these two diets. Give either one of them six weeks and see how you go. Worst case scenario, you’ve eaten a boring and restrictive diet for six weeks. Best case, you’ll figure out how to make your diet work for your endometriosis. Have you already tried one or both of these diets? What works best for you?